In today’s hustle and bustle world, one finds more reasons than most to think that they can eat great food while living alone. Many of us prepare ill thought out foods that are poor in nutrition and many times, poor in taste as well. Taking the time to prepare many dishes does take time but in today’s world of partially prepared foods it is much easier than one would think. Take a look while on the next visit to the local grocery store. Check out how many partially prepared or helper type prepackaged ingredients there are on the shelves. Things even like prepared salads, stir fry bags where you just add the chicken or meat into, pre made meats and sauces for sloppy Joe’s, Mexican dishes and pasta dishes. There are so many starter kits to choose from that preparing a quick easy meal for one does not have to be a task that overwhelms a person. An all-time favorite amongst the younger crowds today is making quadrilles. This Mexican favorite is very easy to prepare but many think this takes up too much time. Purchasing packs of large tortillas at the local store will be the biggest time saver. Even the ingredients within this dish only include 2 cheeses, 2 colors of bell peppers, fajita seasoning, one onion, bacon bits and a tea spoon of oil. The preparation to this great dish will only take you approximately 15 minutes from start to end if the oven is preheated. Even if you choose to skip this popular Mexican dish it is just as easy to make tacos. Again, something like tacos has what many of are familiar with, a prepackaged kit. This kit is easy to use and comes with instructions on the box to follow and enjoy. Both of these quick easy meals are an example of what can be made in no time at all. Choosing to watch calories and fat content within these dishes can be regulated by reading labels and understanding one’s health. Substituting kinds of meats or less fatty meats will also help you easily think of their natural effects on the body. Even people that live alone in the older years can prepare meals that are very delicious. 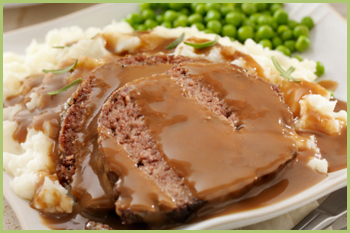 One old time favorite that comes to mind is meatloaf. Even kids today enjoy this meal but many in their twilight years enjoy a meal that can be eaten over and over again. With meat, some onion soup mix, steak sauce and some buttery crackers one can make a quick and easy meal. By preparing this and putting into an oven one can make this dish within 30 minutes. Meals like this can be slightly time consuming to make in the oven but easy re-heating will be a snap to prepare and enjoy. If looking for a heart healthy way to lower the fat content of this dish just add turkey meat instead of beef. When thinking of making a simple sandwich, make it a great sandwich in just a short time. Try making an easy to prepare French Dip sandwich. With thinly sliced roast beef, provolone cheese, hoagie rolls and a little prepared Au jus, you can be on the way to an easy and delicious sandwich. Even making something as simple as a grilled cheese sandwich is something anyone can make in less than 5 minutes. Add something inside this sandwich and it’s easy to see how one can turn it into a whole new enjoyable meal. Ever hear of making Chicken Divan in less than 45 minutes? That’s right, by using canned soup, broccoli, cheese and chicken. This dish can be served on the table in no time at all. Canned soups can be a short cut for many types of meals and sauces. Using this easy shortcut with Chicken Divan can easily save 50% of the time involved in making it over the older slow prepared way. There are many healthy soups with lower sodium, lower fats and less preservatives to make this dish a great heart healthy food. There are so many other choices in the field of preparing on a time restricted lifestyle. Never rule out salads with some kind of flare to add in. These noted additional ingredients may include adding flavored nut oil, like macadamia or walnut oil. Adding in spiced meats or flavored tofu can do the trick. Even tuna can be a basic dress up to the norm by using canned tuna salad. Making homemade soups to enjoy over and over again can be a great ideal. Preparing homemade soup over store bought soups can easily lower the fat and salt content without taking away the overall taste. Salads and soups are just a few options when seeking out quick easy meals that are easily overlooked. 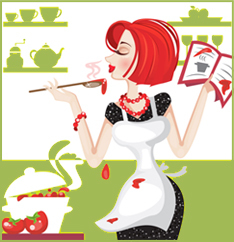 If the world can’t slow down fast enough maybe you can spare that five or ten minutes a day to prepare some great foods. Don’t think that the options are limited. There are so many great recipes and dishes to choose from that one will have to spend 5 minutes picking and choosing what 10 minute meal to prepare. John Hudson has spent too many years alone eating food for one. That he hopes to change this year.